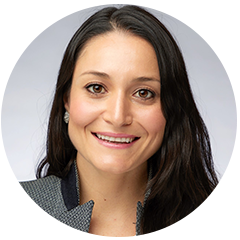 Inna Khidekel, CFA, serves as a Partner at Bridge Investment Group, a real estate private equity investment manager and owner-operator with approximately $15 billion AUM, and Managing Director in its Capital Markets Group. In this capacity, Ms. Khidekel’s principal role is to expand Bridge’s business and product development efforts with institutional investors around the world. Ms. Khidekel serves on the Investment Committee for Bridge Workforce and Affordable Housing. Ms. Khidekel is also the Chair of the Bridge Charitable Giving Committee. Before joining Bridge, Ms. Khidekel worked at Goldman, Sachs & Co. in the Investment Management Division in New York and Chicago where she served as a trusted advisor and managed assets for institutional and ultra-high net worth investors. Ms. Khidekel served on a 3-person advisory team with over $4 billion in assets under management. Prior to Goldman Sachs, Ms. Khidekel worked for Lehman Brothers and Nomura in their London offices, most recently as a Vice President and founding team member in High Yield and Distressed Credit, advising institutional clients on navigating the Eurozone sovereign debt crisis. She began her career at Lehman Brothers on a start-up Emerging Markets Equities trading desk in London. Ms. Khidekel is a frequent commentator on real estate and the affordable housing crisis in the US and has been published or quoted in a number of publications, such as WallStreet Journal, National Real Estate Investor, Affordable Housing Finance, Multifamily Executive and MultiBriefs Exclusive. Ms. Khidekel received her Bachelor of Science degree in Economics from the Wharton School of the University of Pennsylvania, with concentrations in Finance and Legal Studies & Business Ethics, and her Master of Business Administration from Harvard Business School. She is a Chartered Financial Analyst and a member of the New York Society of Security Analysts (NYSSA). Ms. Khidekel is fluent in Russian.